London is littered with cinemas of all shapes and sizes. From the huge to the small but perfectly formed. From the art house to the mass of the multiplexes. There is one cinema, however, that stands out in the centre of London. A real cinema goers dream. 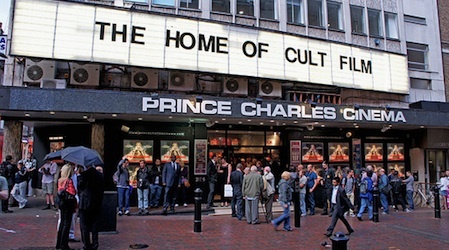 The Prince Charles Cinema just off Leicester Square. Hidden in a side road off Leicester Street and on the outskirts of Chinatown, The PCC is a haven of popular retrospective cinema. Everyday is like a celebration of the cult, the classic and guilty pleasures. Themes, sing-a-longs and quote-a-longs, double bills and movie marathons. If you have a passion for cinema, this is the place to go and share in the experience with other like-minded film fans. When I say share in the experience, this is more than a place to just watch a film. The PCC has two screens; the magnificent Screen one is situated in the basement. If it’s the first time you visit, it can feel a little daunting. Once you have left the bar area where everyone congregates before the doors open (this can be a little like being a sardine in a tin, depending on the popularity of the screenings) the first thing you notice is the way the auditorium dips in the middle so the rake seating suddenly start to rise up. Have no fear. The seats are comfortable and the reddish leather has a slight recline and unless you have a giant sitting in front of you, you should get to see the screen from every angle. Even sitting in the front isn’t a terrible experience. Upstairs from the foyer is screen two, a much smaller, more compact affair in which the few rows that make up the screen are pretty close to the screen but not in a too uncomfortable way. The foyer is also a compact place to be, serving a small selection of confectionery half the price of its multiplex competitors. As the cinema is independent, you don’t mind paying for a popcorn or a bag of sweets. The only thing they don’t offer is hot dogs but they do allow the patrons to have a drink or two. So what’s the main appeal? It has to be the programmes they offer. During the day, the PCC screens second run movies, so if you missed it the first time, you are pretty sure a few weeks after it has finished, it will pop up at this gem of a palace. Again, pricing is a big draw but if you want an even cheaper movie trip, then you can become a membership and this reduces the ticket price drastically. Why would you not want to be a member? At £10 a year, you get £2.50 off your ticket, discounts at the bar as well as 10% off selected stores around London. If £10 is cheap, then you could add another £40 for a lifetime membership at an incredible £50. The place really comes to life with its regular special screenings that run throughout the week. Mondays is double bill night, where two similar or connected films are shown back-to-back, just like you remember from the old day. At Christmas the double bills spread across the week with yuletide films. If there is one downside, it’s having to leave the cinema between films, so if you have found a perfect seat, unless you leave a coat or bag on that seat, chances are it will be taken when the audience return (there is no allocated seating, it’s a first come, first seated affair). Throughout the week they screen classics and occasional silent films with piano accompaniment but the weekend offer the wider choice. There’s the popular sing-a-longs where the audience is encouraged to dress up and join in. The Sound Of Music, Rocky Horror Picture Show and Grease are the usual films but occasionally Little Shop Of Horror and The Lion King also screen. Along with these are the Quote-a-longs or,depending on the films, Swear-a-longs. Throw into the mix Q&As, film festivals and the occasional premiere. The PCC also love bad movies, having a monthly Good Bad Movie Club as well as the best film experience you will have, with The Room. A madcap evening of screaming and shouting at the screen while being bombarded by plastic spoons (you seriously need to go). Grab a group of friends, let yourself go along with the crowd or just listen to the sharply witty comments and enjoy being part of the most fun you’ll have with your clothes on. I absolutely love this cinema. Being a huge film fan it accommodates my movie fixes with friendly staff and a terrific on-line community (many a Twitter conversations have been had). You get the feeling that they really love the films they show. If you are really lucky, you might bump into a celebrity or two and if that isn’t enough, the gents do have the legendary Kevin Smith cubicle (I kid you not! A toilet dedicated to the director of Clerks). Not as highbrow as the other great retro cinema in London, The BFI, but if you like your film either kitsch, cult or just classic, then head down to this cinematic gem.